The emergence and growth of digital technologies broadly underlies much of the technological change affecting the TV broadcasting industry. The production of all sorts of programming has been affected by the growing capacity of producers to use computers and even tablets and smartphones to create content. As a consequence, the costs of producing many types of video programming have declined substantially. At the same time, the Internet is becoming a major distribution channel for streaming video content to viewers. The latter development has lowered the cost of distributing video content, while also increasing the demand for content.Against this background, the Canadian Radio-television and Telecommunications Commission, the CRTC, recently modified its broadcast regulations to facilitate increased consumer choice in viewing TV broadcasting content. Perhaps the most fundamental change is the regulator’s mandate to conventional broadcast distributors to make programming available to viewers on a “pick-and-pay” basis. Essentially, viewers will be able to acquire individual programming services or small packages of programming services. Yet in other ways, the structure of the regulatory environment still follows what might be described as a protect-and-subsidize model. This long-standing regulatory strategy limits market competition so as to generate increased profits earned by programming services and broadcast distribution units. The quid pro quo is that regulated programming services and broadcast distribution units must contribute to financing the production of Canadian content.The main justification for the protect-and-subsidize model is that, left alone, market competition would fail to provide “sufficient” Canadian content. This justification is premised on the existence of significant externalities in both the consumption and production of Canadian content. Externalities are benefits or costs affecting “third parties” to economic transactions. The most prominent suggested externality is a strengthening of Canadian national identity associated with viewing Canadian content. That is, Canadians allegedly feel their nationality more strongly when they consume programming that is deemed by the government to be Canadian content. In fact, there is no compelling empirical support for the national identity externality argument, at least as far as popular entertainment content is concerned, although popular entertainment programming is largely the focus of Canadian content rules and regulations. To the extent that programming imparts consumption externalities, it is more likely to be news, public affairs, and related programming that does so. To the extent that such programming would be “undersubscribed” in the absence of government financial support, it is arguably more efficient and more democratic to subsidize this type of programming directly through the tax system, as in the case of the Canadian Broadcasting Corporation (the CBC).Production externalities are associated primarily with a deepening of the pool of available creative and technical workers in given locations. This deepening of a skilled labour pool helps create clusters which contribute to improved productivity on the part of the organizations that locate in a cluster. While skilled labour can be created through the activities of subsidized program producers, it is more efficiently created through education and training that can and should be carried out through the educational system.A second justification for the protect-and-subsidize model is that Canadian producers simply can’t compete against US-based producers, because the latter can recapture most of their costs of production through sales in their domestic market. At best, this argument applies to “blockbuster” feature films and made-for-TV dramas. In fact, technological change is creating opportunities for entrepreneurs who are able to exploit new viewing patterns and new distribution channels and devices, and Canadian producers are at no obvious disadvantage relative to US producers in this regard. Indeed, stronger market competition is likely to promote entrepreneurship on the part of Canadian producers of programming content.A greater reliance on market competition in the TV broadcasting sector would see the regulator eliminate regulatory preferences for Canadian programming, as well as Canadian content requirements. The CRTC would also eliminate required expenditures on Canadian programming by non-exempt programming services and broadcast distribution units (BDUs), such as cable companies. As it currently stands, the exemption enjoyed by so-called over-the-top (OTT) programming services such as Netflix from making financial contributions to Canadian programming is a regulatory asymmetry that provides an inefficient implicit subsidy to OTT services. Rather than expanding financial obligations to OTT services, eliminating existing obligations of non-exempt programming services and BDUs is a preferable option.The CRTC recognizes the potential competition posed by OTT broadcasting to conventional participants in the sector, but it worries about vertically integrated BDUs abusing market power to forestall actual competition. As a consequence, the regulator has imposed restrictions on vertically integrated BDUs with respect to the latter’s dealings with independent program distributors, on the one hand, and with independent BDUs on the other hand. The restrictions may well inhibit investments in programming by vertically integrated BDUs, as well as discourage their investments in innovative distribution platforms. The regulator’s concern about vertically integrated BDUs leveraging market power to restrict competition seems inappropriate in the face of increasingly intense competition in programming services and the growing importance of wireless carriers as programming distributors. 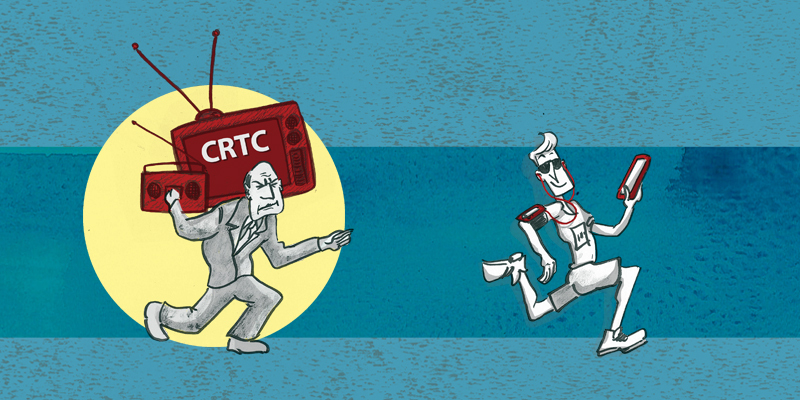 To be sure, however, the CRTC’s commitment to expedite the entry of independent BDUs into the market is to be applauded.Finally, while the CRTC will apply pricing regulations solely on the entry-level package of services, it has cautioned industry participants that it might intervene at both the wholesale and retail levels if unreasonable prices are charged. The threat of intervention by the regulator into pricing behaviour invites frivolous complaints by non-vertically integrated market participants about either excessively high prices being charged by programming services of non-exempt BDUs or excessively low prices being paid by non-exempt BDUs for programming produced by independents. The CRTC has recognized that uncertainty about what is appropriate or inappropriate behaviour under the Wholesale Code is undesirable from an efficiency perspective. As the TV broadcasting sector becomes increasingly competitive, it seems appropriate for the regulator to largely refrain from intervening into the price negotiation process, as well as into other elements of bargaining between participants in the sector.